Like many other Irish Draught Horse (RID) owners, I have fallen in love with this unique, noble and talented breed. I find myself most fortunate to have fallen into ownership of such an animal. Shaun, himself, has an interesting story behind him. He was the top weanling at the Dublin Show in 1984; Carlisheen Molly, his Dam won Reserve Champion mare that year, and Shaun was bought by a Canadian man and imported as a yearling at this time. Aware of this great opportunity, but unable to carry it out, he was then turned out to pasture with a small Thoroughbred mare and put on the back burner...for many years. Fast forward to 1991. 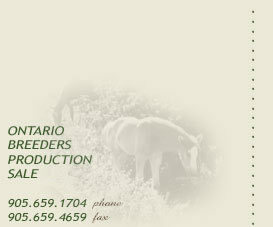 At this time, Shaun, the TB mare (in foal yet again), and five young offspring, still grazing in the same pasture, were transported to our Farm, owned by Barb Bowen. We at Orchard Park Stables cared for and placed all of the young stock, including the Mare in foal, to good homes and kept Shaun at our place for three months training. Shaun was quiet, easy to work with and a gentleman to train, showing superb ability and potential. He then went back to his owner for the next seven years, to again be put on the back burner. On New Year�s eve, 1998, Barb received a phone call asking if she would like first chance to own this remarkable and unforgettable horse. 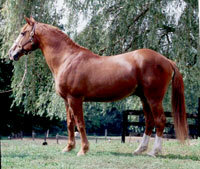 Owning five Stallions at the time and knowing this stallion to be a good horse, my mother didn�t even hesitate, and she became the proud owner of the only son of Pride of Shaunlara in North America at that time. So, on New year�s day, Barb, her husband Alan, and a couple of good friends, took their truck and trailer to fetch her new horse. When approached in the loafing shed that he resided, Shaun was wary of his new intruders, but with a loud snort and an arched neck, put his nose forward, and as that lead shank snapped on him, he instantly relaxed and was ready to follow. He then jumped right on the trailer like he had done it every day of his life and has never looked back. Since we have owned Shaun, we have incorporated him into our breeding program, and I have researched the Irish Draught Horse, realizing in the process what a treasure we really do have. 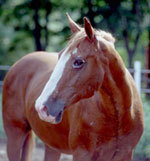 A good friend of mine went to Ireland, shortly after we acquired Shaun, and visited Suma Stud with pictures of him. They recognized him right away and were thrilled to learn of his whereabouts and glad he was alive, as they hadn�t heard of him since his departure. After proving his heritage through DNA and Blood, and going through an inspection, he is now registered and approved as an RID Stallion. When the inspectors arrived at our farm, they later told us that they had no idea what to expect from a 19 year old Stallion they hadn�t heard from in years and hadn�t a show career, or any known offspring. And when they saw him come out of the barn, they said that they were indeed pleasantly surprised at his presence, his great condition, and how well turned out he was. They also mentioned that he was one of the most clean legged horses they had seen in a long time, and how hardy he was, representing the RID�s strength and agility very well. After seeing him on the line, free-jump, and go through a thorough vet check, they took me aside and complemented me on how wonderful he was and how impressed they were with him...putting me in tears as they told me he had passed. At last, everyone else would know what we had already known for years; that he indeed is a remarkable and unique soul. We then presented his offspring for inspection and advisory inspections, and were delighted when the two inspectors went out of there way and gave a short clinic, using Shaun as their model, about the Irish Draught. At this time they explained all about the breed and conformation, what they expect from an RID and said that it is a great loss to Ireland that Shaun did not get approved and used at stud much earlier in his career. Also specifying that Shaun is a traditional type in conformation which is rare today, and has a full sibling, known as Coral Sea, in Ireland that competed at the international level in Show Jumping. They were impressed by his strong ability to mark every one of his offspring and complimented us once again on the quality of our young stock. 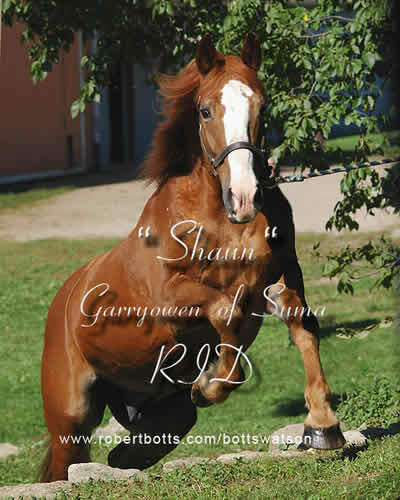 We feel honoured and privileged to own Garryowen of Suma and are very proud of his offspring to date and will continue to love and cherish this stallion. I trust there will be many more foals to come, god willing, and anticipate great accomplishments in whatever discipline Shaun�s offspring endeavour. If you take a look at the Population statistics of the different breeds of the world, and then the amount of those in competition at the International levels, you will find an uncanny ratio in the Irish horses in comparison to the other Sport Horse Breeds. Some of the magnificent Irish horses to have competed Internationally in the past, and who compete today include Hopes are High, Cruising, Custom Made, Crosstown Dancer, Murphy Himself, Giltedge, Mill Pearl, Ado Annie, Flash La Silla, Hilton Flight, Cagney and Special Envoy, just to name a few. What a remarkable achievement for such small numbers! Although the Irish Draught Breed has been in existence for centuries, it is a native breed and has been recognized as a distinctive breed since 1917. 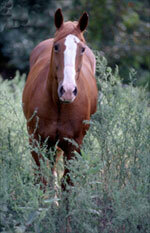 Irish Farmers bred this horse to be adaptable, out of necessity. They had to be versatile and durable enough to pull carts, do some light plough work, while still having the temperament to be used as the family horse, and be athletic enough to hunt all day, having the courage to go the distance and jump anything put in front of them. On top of all of this, they kept weight on easily and fared well on whatever the farmer had to offer. The introduction of Farm equipment and the demand for these horses in Europe during WW1 almost wiped out the entire breed, and even today there are less than 2000 registered purebreds in the world. This makes them a rare breed and is currently categorised as endangered. Today, with many years of selection, we have a very strong, free moving, horse that stands between 15.2 and 17 hands, that has a natural jumping ability, a heart of gold, this absolutely wonderful attitude that makes them a pleasure to train, and a presence of self confidence that makes you want to watch them forever. To many people, when they hear the word "Draught", they automatically think, "Budweiser". I once read that the term "Draught" was derived from and given to those types of horses, because so many were drafted into the European Armies. Other articles state that they believe the term Draught simply means that the animal works by pulling. 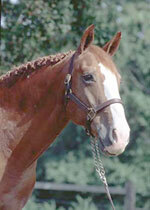 Either way, these horses who are far from "Budweiser", have made their way into the hearts of many owners, from the Amateur rider to the professional competitor at the international level, and by breeding to the well known Thoroughbred and other fine sport horses, produces the Irish Sport Horse. Maybe, in the future, we can look back and claim that we played a role, large or small, in expanding the population of one of the most talented, unique and certainly the noblest breed on the planet. I sure hope we can. Stallions: 15.3 h.h. to 16.3 h.h. approx. Mares: 15.1 h.h. to 16.1 h.h. approx. Good, bold eyes, set well-apart, long, well-set ears, wide of forehead. Head should be generous and pleasant, not coarse or hatchet-headed, thought a slight roman nose is permissible. The jaw bones should have enough room to take the gullet and allow ease of breathing. Shoulders should be clean-cut and not loaded, withers well-defined, not coarse; the neck set in high and carried proudly. The chest should not be too broad and beefy, the forearms should be long and muscular, not caught in at the elbow; the knee large and generous, set near the ground; the cannon bone straight and short, with plenty of flat, clean bone, never back of the knee (calf kneed), i.e. not sloping forward from knee to fetlock. The bone must not be round and coarse. The legs should be clean and hard, with a little hair permissible at the back of the fetlock as necessary protection; the paster stong and in proportion, not short and upright nor too long and weak. The hoof should be generous and sound, not boxy or contracted and there should be plenty of room at the heel. The back to be powerful, the girth very deep, the loins must not be weak but the mares must have enough room to carry the foal. The croup to buttocks to be long and sloping, not short and rounded or flat topped; hips not wide and plain; thighs strong and powerful and at least as wide from the back view as the hips; the second thighs long and well developed; the hock near the ground and generous, points tot too close together or wide apart but straight, they should not be out behind the horse but should be in line from the back and the quarters to the heel to the ground, they should not be over bent or in any way weak. The cannon bone, etc., as for the foreleg short and strong. Smooth and free but without exaggeration and not heavy or ponderous. 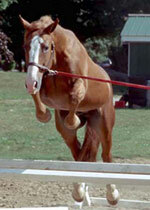 Walk and trot to be straight and true with good flexion in the hocks and freedom of the shoulders. Any strong whole colour, including greys. White leg, above the knees or hocks, not desirable.